Chime time keeping – With a dual chime Function you&apos;&apos;re able to stay focused on the task at hand, you will know what the hour is simply by listening to the sound: Chime 1–Every Hour; Chime 2–Only From 7AM-9PM. Can be turned off during night hours. LED projection: Press the button then current time is projected on wall or ceiling for about 10 second, especially clear at night or on dark place. Voice talking function: Time will be read and told via voice report so you don&apos;&apos;t have to stop and check the time yourself. 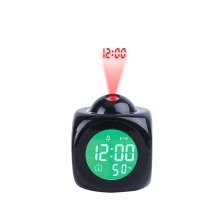 3-in-1 LCD Screen displayed: Time, Temperature, Alarm function. Also work as an electronic THEMOMETER: you can read the live temperature on the LCD screen.